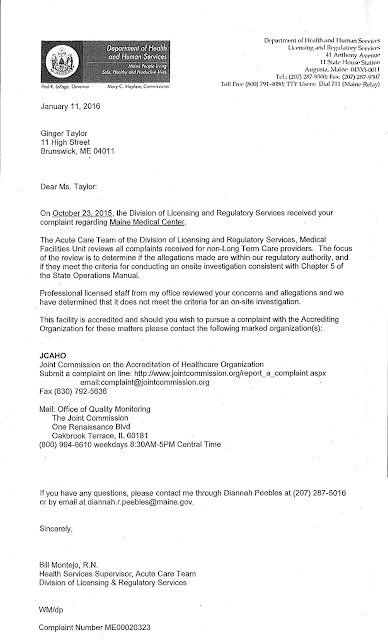 Ms. Grantham, representing Maine Health, made further false claims on December 1, 2014 on MPBN’s Maine Calling, when she claimed that there were multiple studies comparing populations of unvaccinated children to children fully vaccinated according to the CDC schedule that have found no increased risk in autism among fully vaccinated children. Further, it is imperative that the State of Maine provide oversight in this matter, as the federal 1986 National Childhood Vaccine Injury Act has removed the rights of families to sue corporations like MaineHealth when members are harmed or killed by a vaccine. The result of this blanket liability protection which has been in place for decades is that physicians, medical care providers, health corporations and even government agencies routinely put out false safety and efficacy information, because there is no mechanism by which the public may directly hold them accountable for fraudulent claims. The public’s right to take these entities into a civil court, force them to testify under oath, have judgments rendered by a jury and have remedies be enforced by a judge has been removed. As a result, misinformation can be circulated by both malicious and merely uninformed parties, including doctors providing recommendations to patients in their offices. Bad faith parties and organizations who wish to make outright fraudulent claims are free to do so without fear of legal reprisal from their customers, even if the worst possible outcome happens and the vaccination that was delivered under false information or coercion results in the death of a child. The autism and vaccine injury communities have been asking for such a retrospective study to be done for more than a decade now, and health authorities have continued to refuse. Rep. Carolyn Maloney (D-NY) introduced the Comprehensive Comparative Study of Vaccinated and Unvaccinated Populations Act of 2007 (http://thomas.loc.gov/cgi-bin/bdquery/z?d110:h.r.2832🙂 to force NIH to do such a study, and reintroduced such legislation in the years since. In response to what he learned from Dr. Boyle during the 2012 hearings, Rep Bill Posey (R-FL) joined with Maloney and introduced H.R. 1757, The Vaccine Safety Study Act (https://www.congress.gov/congressional-record/2013/04/26/extensions-of-remarks-section/article/E576-1) that would again compel HHS to perform the study that you claim already exists. 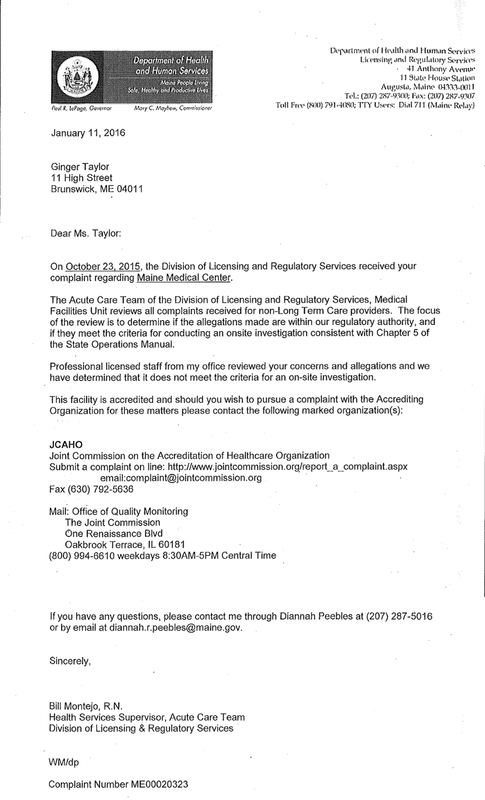 On your December 1 episode of Maine Calling, Cassandra Grantham, a representative of MaineHealth, made a fraudulent safety claim on your show. I have copied you on the my email exchange with her, which details the false claim, my correction of the false information as supported by the Congressional testimony of the head of the CDC’s Director of the National Center on Birth Defects and Developmental Disabilities, and my request to Ms. Grantham for her to cite the multiple studies that she claim exist or retract her claim. I there for request that Maine Calling retract Ms. Grantham’s claim in the same format which it was offered, noting the false claim on the archived version of the interview if MPBN chooses to leave it online. I further strongly encourage Maine Calling to perform an honest evaluation on why vaccine rates are low in Maine and falling nationally. As the educated mother of a vaccine injured child, I can attest to the real reason. It is because the liability protection given to the entire vaccine industry in 1986 has resulted in massive corruption in the vaccine program. Ms. Graham’s behavior on your show is case in point. Medical providers and medical industry representatives can make any safety claims that they choose, even completely false claims, because there is no accountability mechanism in place for the public to hold them accountable for false claims. Even when a child is killed by a vaccine after a false claim like this is made to a parent coercing them into administering a vaccine that they would not have otherwise agreed to have delivered to their child, there is no recourse to hold anyone accountable, or even force them to stop making these false claims. So false claims like this one, once spoken by someone claiming to hold authority in vaccinated, simply continue to circulate and be repeated. No doubt Ms. Grantham’s false claim will now be circulated by those who have heard your program, even medical professionals who administer vaccines to children. But for now, I await a response on your retraction of this particular false statement. I cannot imagine that MPBN would allow any medical professional, industry representative or government official to make such false claims about any other medical product line or medical program. I don’t expect Maine Calling to allow this to stand either. This past week, Cassandra Grantham of MaineHealth appeared on MPBN’s Maine Calling and made a fraudulent vaccine safety claim. She reported to the public that there are several studies comparing vaccinated v. unvaccinated children that find no increase risk of autism and other developmental disabilities in children vaccinated according to the CDC’s recommended schedule. I wish to file a formal complaint against Ms. Grantham with MaineHealth. I believe that it is the duty of MaineHealth to review and retract Ms. Grantham’s false vaccine safety claims and to exercise disciplinary action against Ms. Grantham, as well as clarify the organization’s position on the rights of parents to receive full and accurate vaccine safety and efficacy information, and practice uncoerced informed consent in vaccination. Thank you for forwarding your complaint so quickly. Your complaint will be triaged according to the severity and assigned to an investigator, if deemed necessary. where in the process your complaint is. also forwarded to patientrelations@mmc.org, no response as of this filing.